Sadly, far too many children do not get the recommended 800 to 1,300 mg of calcium they need to build and support healthy bones. 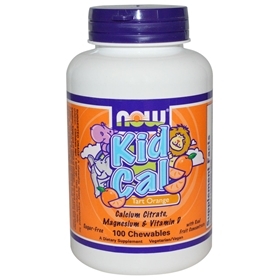 And with this as our motivation, we’re pleased to introduce new NOW Kid Cal Chewables. These animal-shaped chewable lozenges have a great taste that kids will enjoy, making it easy for them to get the calcium they need to grow strong and healthy. Each 2-lozenge serving contains 200 mg of Calcium Citrate, 100 mg of Magnesium, 400 IU of Beta-Carotene, 200 IU of Vitamin D and 90 mg of Orange fruit extract. We’ve sweetened it with Xylitol and Fructose to give them a taste your children will enjoy, and used chelated minerals for greater assimilation and digestion. Calcium is the single most abundant mineral in our bodies and is essential for our well-being, but that is not the whole story. Magnesium is what enables calcium to work and is at least equal to calcium in overall importance. Without sufficient magnesium, our bodies cannot use calcium properly. Magnesium is what keeps calcium dissolved in areas of the body where it needs to be, such as the muscles, joints, kidneys, heart and brain, etc. But when the body doesn't have enough magnesium, calcium is pulled away from the bones and can cause major problems throughout the entire body. Vitamin D promotes calcium absorption and calcium transport to bones, but does so much more. It keeps the immune system strong, reduces respiratory infections, and prevents bone problems, such as rickets. Rickets is a skeletal deformity mostly seen in children with vitamin D deficiency. . . Under 4 yrs.-Over 4 yrs. Other Ingredients: Fructose, Xylitol, Cellulose, Stearic Acid (vegetable source), Natural Flavors, Coconut Oil Powder, Xanthan Gum and Silica. Contains soy and coconut oil powder. Caution: Keep out of reach of children. Consult your physician if your child has any medical conditions or is taking any medications. Contains Xylitol, do not feed to pets. KEEP BOTTLE TIGHTLY SEALED.